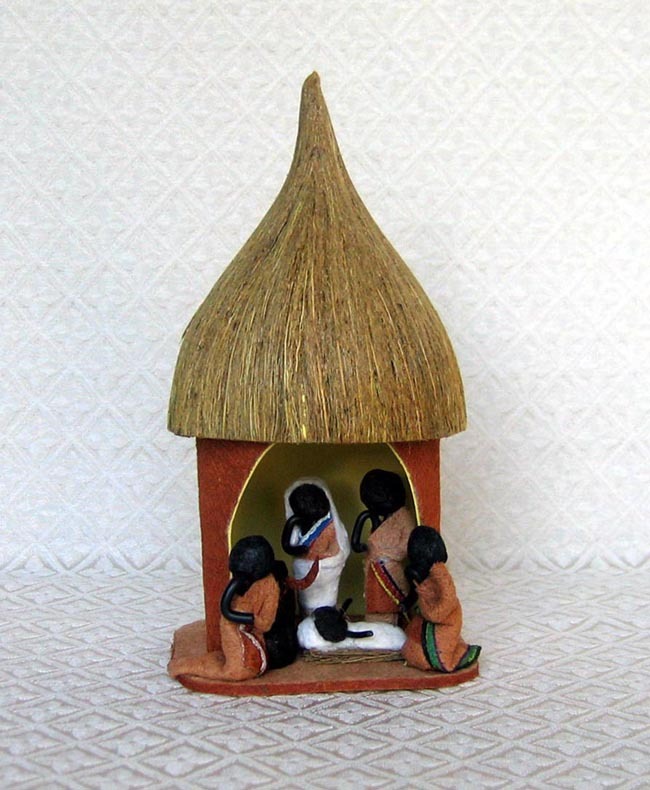 This Nativity features the Holy Family visited in their African hut by two shepherds and an ox. The base of the hut is wood, covered with bark cloth. The walls and roof are yellow cardboard. The walls are covered with bark cloth while the roof is covered with spear grass that has been glued to the cardboard to make a distinctive roof point. The figures wear bark cloth and their arms are fashioned from black electrical wire. The Nativity measures 8 inches tall by 4 inches in diameter. This item is made by Yekosofati Buwembo, a disabled father in Kampala, Uganda. He is married with 4 children. Despite his reliance on crutches for mobility, he prefers the motto: “Enabled, not disabled!” He makes huts using bark cloth and spear grass, in which he creatively depicts African homesteads. He is able to send his children to school, manage his home, and buy clothing because of his craft.